Smells Like Breakfast: Rotorua | POMS AWAY! To get to Rotorua, you could catch a domestic flight from Auckland, Wellington, Christchurch or Queenstown, or book a coach, but the best way is to drive yourself, as you don’t have the cost or hassle of flying, it doesn’t take as long as in a coach, and you can pull over and get out whenever you see an interesting attraction on the way. You can hire cars cheaply in New Zealand, or, even better, you can hire a campervan. This gives tourists a great amount of freedom, as your accommodation is already taken care of. Even though we’ve lived in New Zealand for eleven years, my family feels no need to travel overseas to take a holiday – we just hire a campervan and go. I don’t know why we don’t just buy a campervan. There are heaps of holiday parks in New Zealand, where you can park your campervan for the night and take advantage of the facilities, and Rotorua is no exception. They’ll all have fliers in their receptions advertising Rotorua’s top visitor attractions, but – take it from me – the best places you can go in Rotorua are FREE. The building used to be a Bath House, which I find both romantic and creepy: romantic for the image of Edwardian elite taking to the geothermal spring waters; creepy for the image of mental patients being held down in pools and subjected to electroshock therapy. The museum, while not free, is well worth a visit. 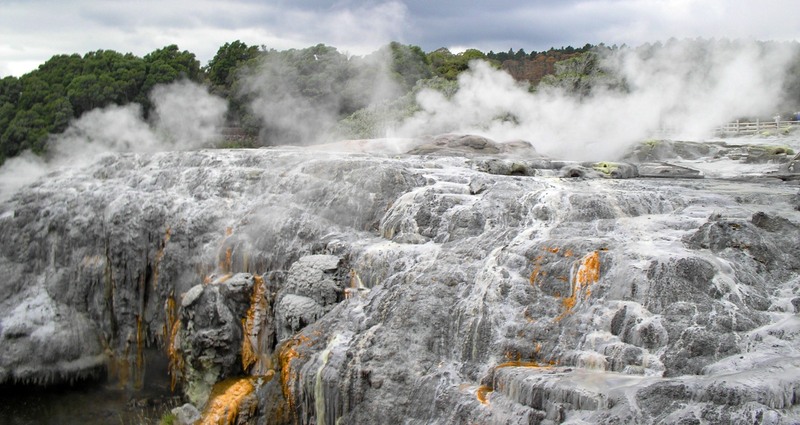 The Tarawera exhibition in particular is a must-see, as it brings to life the most disastrous volcanic eruption in New Zealand’s recorded history. If you don’t want to pay to get into the museum, however, it’s still worth a visit to the area it’s in, and not just to gaze upon the building. The museum is situated in the historic Government Gardens, which are free to enter and very nice to walk through, with an array of beautiful flowers and geothermal features. It’s another thing my family always does in Rotorua. We like doing free things – we’re Northerners. Here’s another thing you can do for free in Rotorua: take a walk around Lake Rotorua. The water at the edge of the lake is a strange colour – a sort of creamy turquoise – from the sulphur. 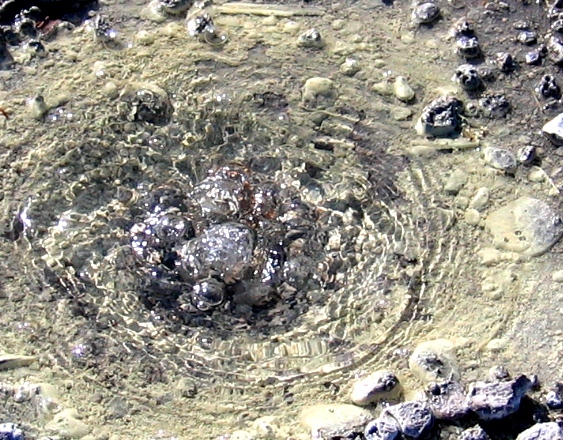 Steam rises from it in places and, as you walk, you will stumble across miniature hot pools, like this one. I stepped over this little thing! 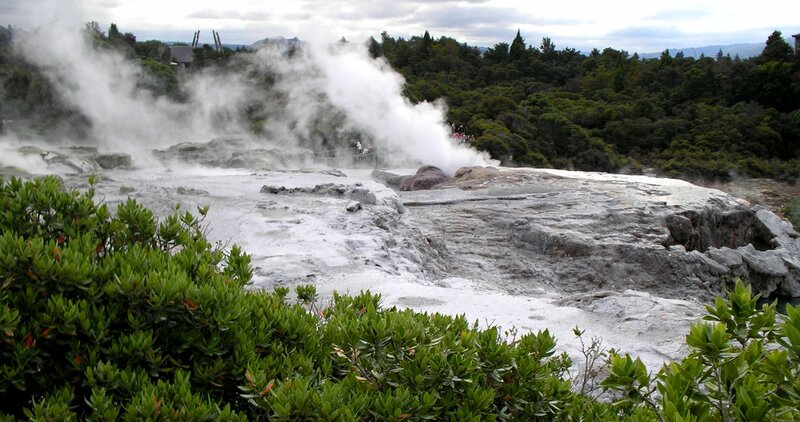 As for those readers who have already been to Rotorua, if you know of any great places to go there that I’ve missed, (especially free ones,) please say so in the comments section. 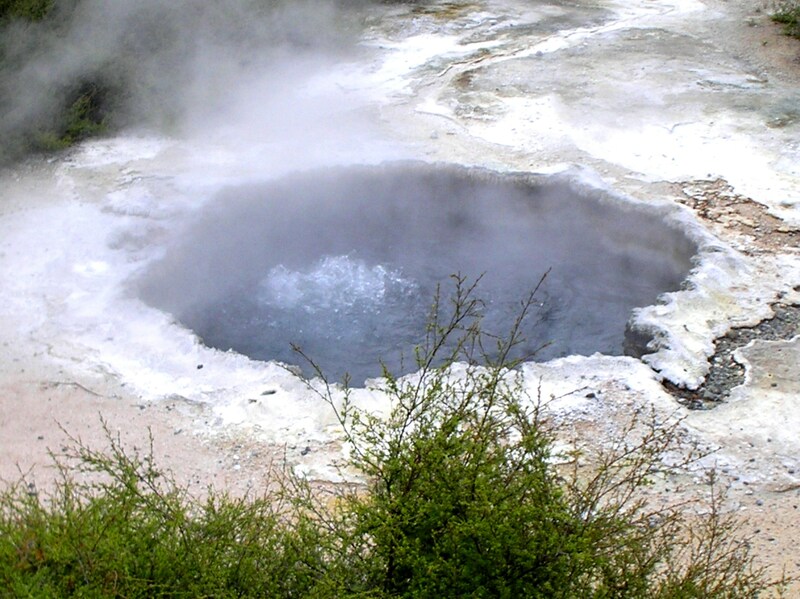 This entry was posted in North Island, Places, Tourist Experiences and tagged campervan, Government Gardens, hot pools, Lake Rotorua, New Zealand, nz campervan hire, Queenstown, Rotorua, Rotorua Museum, The Luge. 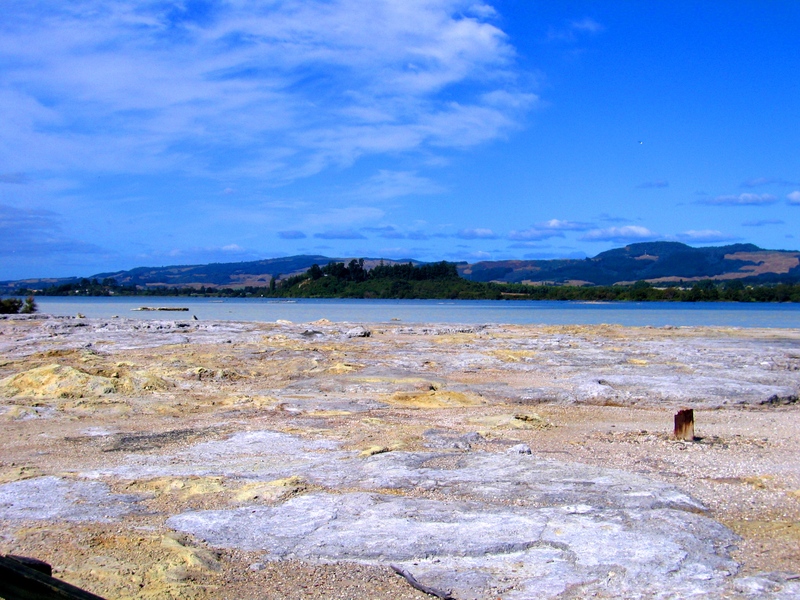 The place is so picturesque, do you happen to have any more pictures of Rotorua? Well I’ve got a few more on my computer, and my dad will have some from a few years ago. I wish I’d read this post before I visited Rotorua! Thanks for stopping by my corner of the intraweb and checking out my ramblings. I’ll be stopping by your’s from time to time to plan my next NZ trip. Take it easy!